What’s in a name? If you’re in the consumer-goods field, how you name and label your product impacts consumer perception. Packaging and labels may be the first point of contact between your product and the consumer, and can influence purchase decisions, so what’s written there is very important. For an interesting case study on the significance of product names, let’s look at the organic wine industry. Organic products of all kinds are in demand for health-conscious consumers. Many command premium prices, which consumers don’t seem to mind paying, understanding there are increased production costs. It seems like no one explained this to the wine-buying public, however. A study conducted by the University of Florida Institute of Food and Agricultural Sciences followed the sales of more than 400 premium wines produced by 50 Tuscan wineries between 2000 and 2008. They found organic wines regularly fetch lower prices than their non-organic counterparts. What gives? Consumers seemed perfectly willing to pay more for premium wines that were organic but not labeled as such than for “standard” wines. Bottles clearly labeled “organic,” however, did not sell as well, or for as much as unlabelled organic wines or non-organic premium wines. Evidently, the organic label carries a stigma in the wine market. Some wine producers believe the term evokes images of hippies and chases away wine connoisseurs. It’s an example of how the perception of quality can impact sales, albeit in a non-intuitive manner, and makes a compelling argument for taking the time to understand your target consumer before you label your product. Supporting the idea of names and labels influencing sales, we turn to a study carried out at Stanford University. To test the power of a name, researchers tracked vegetable sales in the school cafeteria. Every day, the vegetable dish on offer had a different name drawn from one of four categories: basic, healthy restrictive, healthy positive, and indulgent. Indulgent labels carried the day, resulting in a 25% higher selection rate than basic labels, 35% higher than healthy positive labels, and 41% higher than healthy restrictive labels. 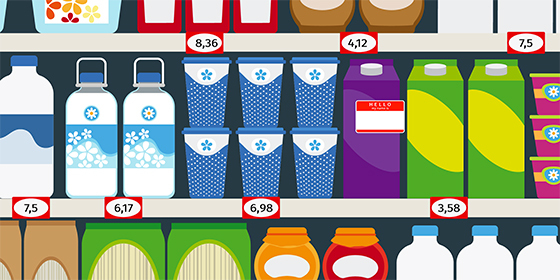 The study reaffirms food labelling plays a major role in influencing perceptions of flavour and quality, and, ultimately, the decision to purchase.